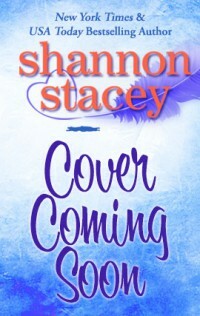 « Looking for a quick, romantic Valentine’s Day read? Last month, my husband and I took a road trip to Moosehead Lake region of Maine to do some snowmobiling. When we travel, I often see things that pique my curiosity and I look them up on my phone. But there are still places with no cell coverage at all and we were in one of them. I knew it was going to happen like this: See interesting thing. Can’t look it up. “Oh, I need to remember to look that up if/when I ever get cell reception again.” Forget the thing. Spend the 2am hour trying to remember the interesting thing I wanted to look up. So I made notes on my phone of things I saw that I want to know more about. That welcome-to-town sign definitely caught my attention because when you think of knights, remote parts of Maine don’t generally come to mind. From the town’s website: The town was named after Colonel Calvin Sanger, an early settler and landowner. It is the birthplace of Sir Hiram Stevens Maxim (1840–1916) and Sir Harry Oakes, 1st Baronet (December 23, 1874 – July 7, 1943). Apparently, Maxim created the first portable fully automatic machine gun. He earned his fortune in Canada and in the 1930s moved to the Bahamas for tax purposes, where he was murdered in 1943 in notorious circumstances. The cause of death and the details surrounding it have never been entirely determined, and have been the subject of several books and four films. Another welcome-to-town sign. I remembering at the time wondering if it was voted the best town to live in, but that seemed unlikely. (Sorry, 700 people of Abbot. It’s lovely, but you’re competing with Ogunquit and Bar Harbor and that’s just on the coast.) And it’s too far from the ocean or Massachusetts to have been the literal #1 town (which was Kittery). So, then I wondered if it was the first town after the split from Mass. Nope. OH WAIT. 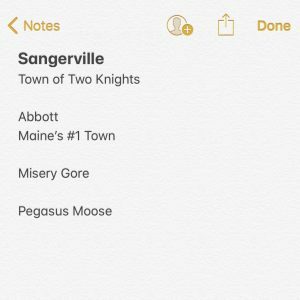 It’s alphabetically the first town listed for Maine. Okay, then. Just a gore with a cool name, I guess. (Gores are little bits of land that fall through the survey cracks, which you can read more about here if you’re so inclined.) Despite it being Stephen King’s state, Misery Township predates the book. 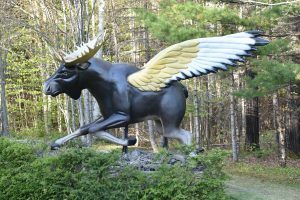 I wasn’t able to get my own photo because my husband drives fast and the snowbanks on the side of the road were very high, but I caught a glimpse of a moose statue with wings. I was able to get a stock photo for y’all, though. You can see why it caught my eye. Apparently the statue honors an old Abenaki legend. You can read a good (short) article about it here. Maybe someday (when they have cell coverage and fast food restaurants) I’ll go back when trying to get to the statue doesn’t involve scaling a wall of snow they could use for filming Game of Thrones. This entry was posted on Wednesday, March 20th, 2019 at 8:20 am in Uncategorized. You can feed this entry. Both comments and pings are currently closed. I have to write things down as I can forget things going from the living room to the kitchen. Sounds like it was a fun trip.